It’s easy to stay active while exploring enchanting destinations in Tahiti, French Polynesia and the South Pacific with Paul Gauguin Cruises. Here are 10 ideas for those interested in health and wellness pursuits. Les Gauguines and Les Gauguins, the m/s Paul Gauguin’s own troupe of Tahitian performers, host Polynesian activities throughout each voyage including traditional Tahitian dance classes, “Tamure Sunrise,” Polynesian Zumba, and morning mile-long walks around the ship’s deck. The Gauguin has a retractable watersports marina and offers paddleboarding and kayaking in select ports. Guests may also access complimentary snorkeling gear to use throughout their voyage from island beaches. 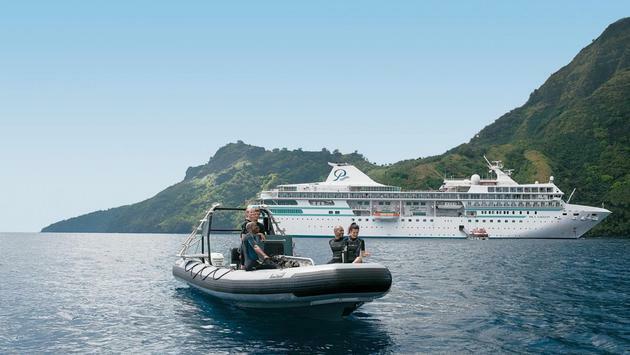 Paul Gauguin Cruises has its own dive team, which provides PADI certification SCUBA diving programs and dive excursions to explore Polynesia’s spectacular lagoons. The Gauguin is also fully equipped with SCUBA diving equipment, an onboard practice pool, a tank-filling station and two inflatable dive boats with ladders. On all sailings, guests receive complimentary access to Paul Gauguin Cruises’ two exclusive retreats. Off the coast of Taha’a lies the islet of Motu Mahana, where they can enjoy a day of swimming, kayaking, snorkeling, Polynesian activities and volleyball. In Bora Bora, guests can relax on a private, white-sand beach, as well as delight in swimming, snorkeling, kayaking, paddleboarding and volleyball. The Gauguin’s fitness center is equipped with an assortment of equipment, including Lifecycles, treadmills, stair climbers and weight machines, and access is included in the cruise fare. Deep Nature Spa by Algotherm is located aboard and offers an extensive menu of optional massages, skin care and facial treatments. Signature Polynesian spa treatments include the following: Polynesian treat by Hei Poi, Bora Bora Deep Blue Massage, Tahitian Wave and Monoi Massages by HeI Poi. Guests can also book relaxing overwater massages to enjoy on the line’s private islet of Motu Mahana. A great way to explore the islands by land and sea is through hiking tours, e-biking, drift snorkeling, underwater walks, aquabike adventures and golf. Paul Gauguin Cruises offers shore excursions for these activities and more. Guests can take a refreshing dip or swim in The Gauguin’s outdoor pool while enjoying stunning views of the islands. Lecturing on the July 10, 2019, Society Islands & Tuamotus voyage is best-selling inspirational author and awarding-winning speaker Tom O’Neil. He has helped a wide range of people, from students to CEOs, achieve their personal and professional goals through his best-selling books, motivational speeches and one-on-one coaching. In his most recent book, “The 1% Principle,” O’Neil reveals how making a 1 percent change in your behavior each day can dramatically improve your life and unleash your potential. On the August 14, 2019, Society Islands & Tuamotus voyage, clinical psychologist Dr. Stephen Sideroff will present a series of presentations designed to help integrate the most advanced scientific and behavioral technologies with ancient traditions for optimal mind and body functioning. And for those looking for healthy food options, The Gauguin’s dining venues offer gourmet cuisine including delicious vegetarian, light and healthy, gluten-free and low-carb menus. Juice smoothies made from scratch with fresh fruit and vegetables are available each morning and quickly become a favorite way to start the day. For more information on Paul Gauguin Cruises, visit pgcruises.com.